In an age where fast food is getting more popular, cooking is a great activity to get your kids interested in healthy foods. But if your little ones are reluctant, here’s an app that might inspire them to get into the kitchen: Dr. Panda’s Restaurant 2. Developed by Tribeplay, it’s a cute role-playing app in which kids whip up various dishes for the animal guests at Dr. Panda’s waterfront restaurant. Kids will be able to choose the ingredients for each dish, and prepare them using various kitchen utensils. They also learn to recognize their customers’ food preferences by paying attention to their facial expressions. Located directly by the ocean, Dr. Panda’s restaurant is a leisurely establishment where an endless stream of customers arrive by boat. Kids serve them two at a time, taking orders for salad, soup, wok, pizza, or pasta. Except for pizza and pasta, the recipes require kids to select up to three (out of 20) ingredients to cook with. The customer will express their approval (or disapproval) of the choice using only body language; they’ll nod if they like the ingredient, and shake their head if they don’t. As for the recipes, the app provides step-by-step instructions while leaving some room for creativity. When making soup, for example, kids can decide for themselves how to prepare the ingredients — they can choose to blend, chop, grate, pan-fry, bake, or boil them — before tossing them into the cooking pot. They can also choose to enhance their dish with salt, pepper, chilli peppers, olive oil, soy sauce, and other seasonings. Kids then serve the completed dish to the customer, who rates it via speech bubbles. Ingredients the customer enjoys will be highlighted in green, while the ones they don’t will be highlighted in red. He or she may also comically sneeze, burp, or breathe fire if the dish is flavored too strongly. Finally, kids finish up by clearing up the plates, and collecting payment from the customers. Dr. Panda’s Restaurant 2 is a simple role-playing app suitable for toddlers ages 5 and up. It is language-neutral, containing neither written text nor narrations. If your family is vegetarian, it is useful to know that the app provides the option to serve only vegetarian dishes. When this option is turned on, all meat ingredients will not appear. You can turn on this option from the parents-only section. Dr. Panda’s Restaurant 2 does not contain third-party apps or in-app purchases. It does contain (protected) links to other Dr. Panda apps, but you can choose to hide them from within the parents-only section. 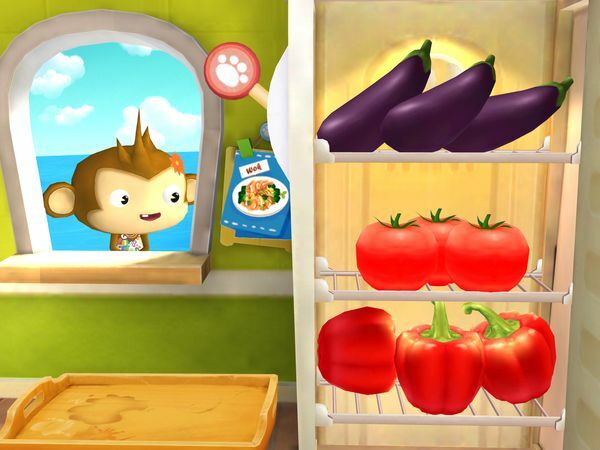 Dr. Panda’s Restaurant 2 is a terrific app empowers kids to experiment freely in the kitchen without actually making a mess, or getting near hot stoves or sharp knives. I like that it provides step-by-step instructions that easily translates into real-world cooking. I think it’s great how the app teaches kids to recognize emotions. The animal customers are cute and expressive, and I believe kids would love seeing their different (and often silly) reactions to their food. The app also gets high scores from me in the graphics department. The cooking process felt realistic what with the ingredients changing in appearance as they are processed. For instance, the fish turns brown as it is pan-fried, and vegetables gradually turn into pulp as they are blended. In terms of enhancements, I would like to see more recipes added (currently there are only five). It would also be nice if kids could use their earnings to buy decorations for the restaurant. Dr. Panda’s Restaurant 2 is fantastic, educational role-playing app that allows kids to experiment with foods and various kitchen utensils. The gameplay is creative and relaxing, with no scores kept and no strict rules applied. Kids decide for themselves what ingredients to use in their dishes, and how to prepare them. They also learn to pick up emotions by observing their customers’ reactions to their dishes. Overall, it’s a great game that I would recommend for budding chefs and just about every other kid, actually. If you liked the app, you should also check out its prequel, Dr. Panda’s Restaurant. It’s quite similar, but with 2D graphics and 11 different recipes.